You are buying Enfamil Enfaport Lipil Ready To Use Infant Formula 6oz Pack of 24, Model #129601EA. ADW Diabetes offers a complete line of Enfamil baby formula products both in liquid and powder form. We offer these items in both single and discounted bulk quantities for your convenience.Shop with ADW Diabetes as we provide excellent customer service, low prices, and fast shipping! The Enfamil Enfaport with Lipil, Ready To Use Infant Formula 6oz Pack of 24 has formulas for many special needs, including Chylothorax. 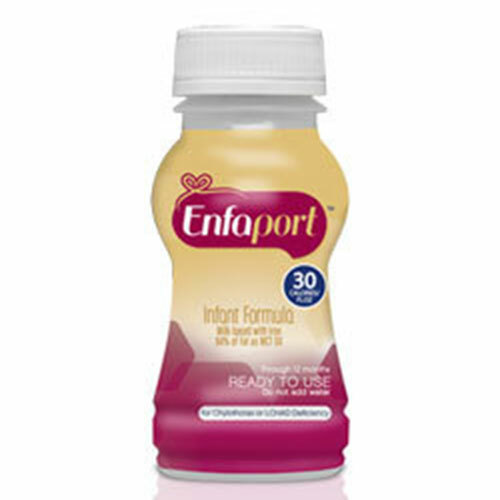 Enfaport infant formula is designed just for babies with Chylothorax or LCHAD deficiency. High levels of MCT oil make fat absorption easier. High protein level supports the nutritional needs of special babies. Includes all the essential fatty acids babies need. Includes our blend of DHA and ARA, nutrients found in breast milk shown to promote brain and eye development. Water, Corn Syrup Solids, Medium Chain Triglycerides (MCT Oil), Calcium Caseinate (Milk), Sodium Caseinate (Milk), Soy Oil, and Less Than 0.5%: Mortierella Alpina Oil(ARA), Crypthecodinium Cohnii Oil(DHA), Soy Lecithin, Carrageenan, Vitamin A Palmitate, Vitamin D3, Vitamin E Acetate, Vitamin K1, Thiamin Hydrochloride, Riboflavin, Vitamin B6 Hydrochloride, Vitamin B12, Niacinamide, Folic Acid, Calcium Pantothenate, Biotin, Ascorbic Acid, Choline Chloride, Inositol, Calcium Carbonate, Calcium chloirde, Magnesium Phosphate, Potassium Phosphate, Ferrous Sulfate, Zinc Sulfate, Manganese Sulfate, Cupric Sulfate, Potassium Iodide, Magnesium Cloride, Potassium Chloride, Sodium Chloride, Potassium Citrate, Sodium Selenite, taurine, L-Carnitine.